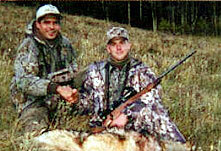 Trophy Hunters Alberta offers complimentary wolf and coyote hunting on all of our rifle hunts. Check out our Photo Gallery to view some of the results of these excellent stand-alone and ancillary hunts. Coyotes are quite large and very plentiful in southern Alberta in both the foothills and prairie areas. Fall coyotes have their new winter fur that is usually in excellent condition. Gary and Tom Miller from Michigan will attest to the beauty of our coyotes as all five of the coyote skins that they took home with them, in addition to their two deer, had different color patterns. 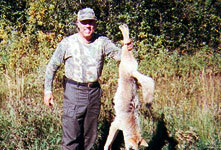 During the fall big game season, we do not offer stand-alone wolf hunts. Rather, we offer both wolf and coyote as a complimentary option with all of our big game hunt offerings. This way our primary focus remains on the big game species our guests are hunting with the wolf/coyote option being a secondary priority. 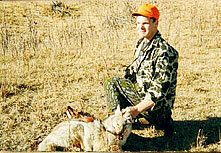 Single species wolf hunts are only offered from January 15 through April 15 where the odds of success are higher.